The following example illustrates the use of PROC COPULA. The data used are daily returns on several major stocks. The main purpose of this example is to estimate the joint distribution of stock returns and then simulate from this distribution a new sample of specified size. Figure 10.1 shows the first 10 observations of the daily stock return data set. The following statements fit a normal copula to the returns data (with the FIT statement) and create a new SAS data set that contains parameter estimates of the model. The VAR statement specifies the list of variables, which in this case are the daily returns of five large company stocks. The first table in Figure 10.2 shows some general information about the copula fitting procedure: the number of observations, the name of the input data set, the type of model and the correlation matrix. Next, the following statements restrict the data set to only those columns that contain correlation parameter estimates. Then, in the following statements, the DEFINE statement specifies a normal copula named COP, and the CORR= option specifies that the data set Estimates be used as the source for the model parameters. The NDRAWS=500 option in the SIMULATE statement generates 500 observations from the normal copula. The OUTUNIFORM= option specifies the name of SAS data set to contain the simulated sample with uniform marginal distributions. Note that this syntax does not require the DATA= option. The simulated data is contained in the new SAS data set, Simulated_Uniforms. 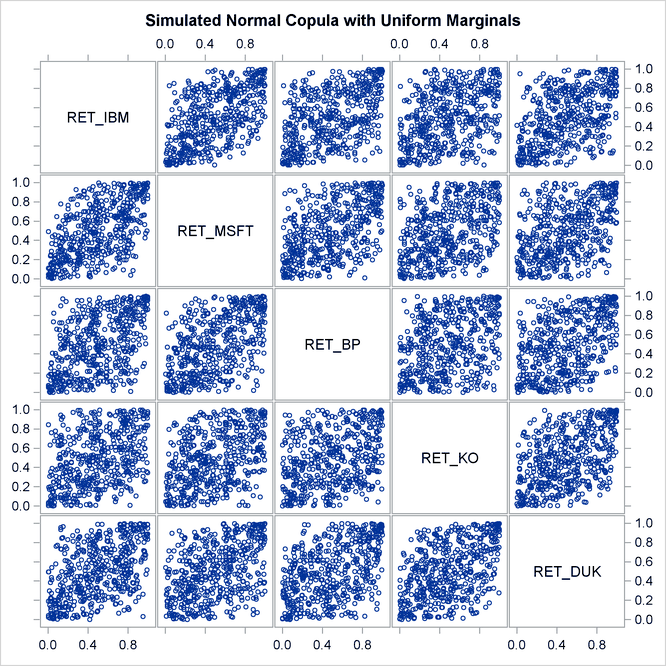 A scatter plot matrix of uniform marginals contained in the data set is shown in Figure 10.3. The preceding sequence of PROC COPULA usage—first fit, then simulate given estimated parameters—is a legitimate sequence but has a limitation in that the second COPULA call does not generate the sample according to the empirical distribution of the raw data. It generates only marginally uniform series. The output of the statements is similar in structure to the output displayed in Figure 10.2 with the addition of parameter estimates and inference statistics that are specific to the copula model as shown in Figure 10.4. For a t copula, the degrees of freedom are displayed (as in Figure 10.4); for Archimedean copulas, the parameter "theta" is displayed; and for a normal copula, this table is not printed. The simulated data is contained in the new SAS data set, Simulated_Returns.